By rights, when a championship can only boast one remotely competitive team in its top class, the racing should be pretty soporific. But despite Audi being rather lonely in the premier LMP1 division, the 2008 American Le Mans Series was a breathtaking thriller. 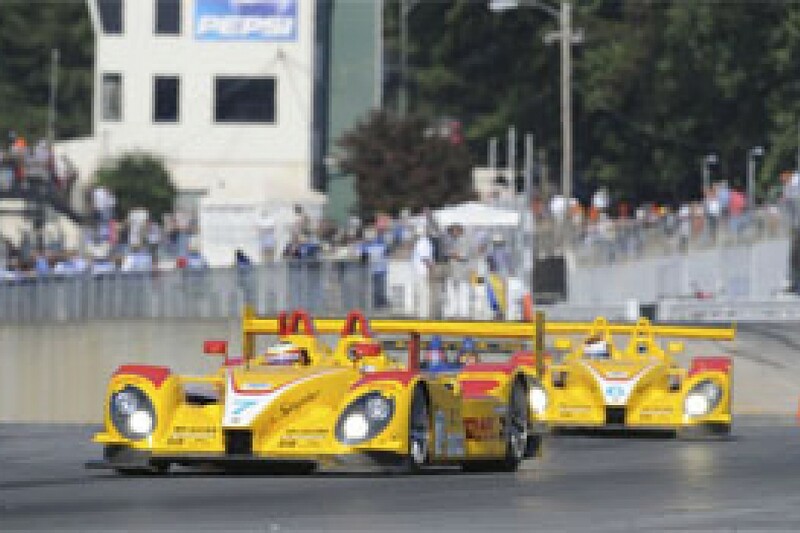 The class structure may have meant that they weren't going head to head for an overall title, but that didn't stop Audi, Porsche and Acura racing each other's wheels off in pursuit of outright race victories, as the LMP1 R10 TDis narrowly reasserted their superiority having played second fiddle to the more nimble LMP2 cars in 2007. History will record eight outright wins for Audi this year compared to just two apiece for Acura and Porsche, yet the racing they produced to secure those victories was far closer than the results ultimately suggested. Most weekends there was little, if anything, to split the three manufacturers in pure speed, and the qualifying sessions were some of the closest ever seen in prototype competition. This was an extremely intense season, with lap records tumbling as the manufacturers hurled new developments at the leading cars. The combination of escalating speeds, extraordinarily close competition, huge speed differentials between the prototypes and the GT2 backmarkers, and fast and narrow circuits with little run-off meant it was also a rather destructive year. Despite the abundant accidents though, there were no serious injuries - a tribute to current safety standards. Audi's seismic decision to withdraw from the ALMS and Porsche's quiet exit (for now at least) at the end of its initial three-year deal with Penske suggests that this season's incredible racing might sadly prove to be a one-off, as Acura will be the only one of 2008's illustrious trio returning next season. 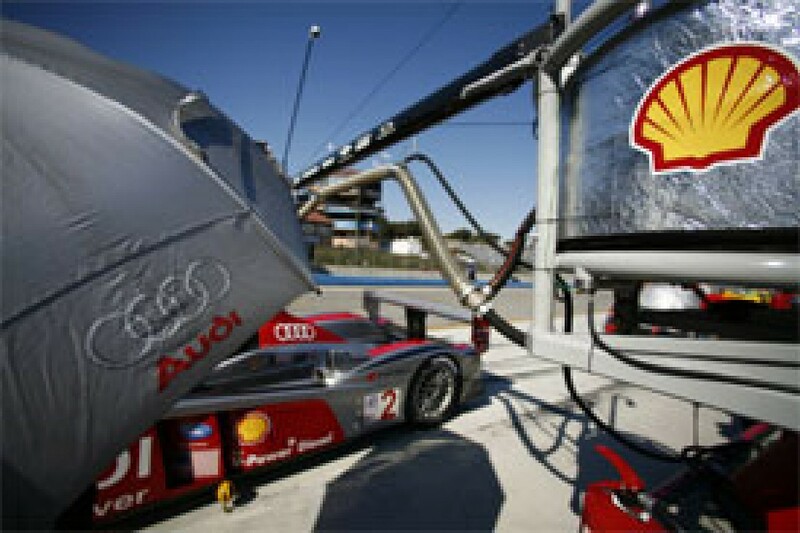 But at the start of 2008, few would have predicted the excitement that subsequently unfolded, for Audi - none too thrilled about a) the lack of competition in LMP1 and b) the ALMS' insistence that the rules should continue to give the LMP2 cars a bit of a leg-up to ensure close racing for outright wins - were wavering over their participation. And on the evidence of 2007, if Audi departed, Penske Porsche would face little competition, for Acura had not been a consistent challenger in their first year. Thankfully those fears proved unfounded. Audi ultimately announced a full-year two-car programme hours before the season-opener, and Acura made a massive step forward with their heavily-revised chassis and a stream of new parts from partner Wirth Research. Plus, having drifted away from the Porsches in mid-2007, Audi also raised their game. The push to match Peugeot at Le Mans and in the Le Mans Series meant a more concerted development effort, and crucially for their ALMS form, more of those components made their way across the Atlantic to Champion Racing. The only missing element in the 2008 ALMS story was a regular Peugeot entry, but the French team popped across for the season-opening Sebring 12 Hours as a Le Mans rehearsal - and gave an unfortunate preview of subsequent events in Europe by storming away from the field only to wilt with mechanical problems. But unlike at Le Mans, the Audi challenge also fell apart, allowing Penske Porsche's Timo Bernhard, Romain Dumas and Emmanuel Collard to take a surprise overall win. This had looked unlikely when the sister car became the race's first retirement and Dumas picked up both bodywork damage and a penalty early on. Audi got their season on track with back to back street course wins for Marco Werner and Lucas Luhr at St Petersburg and Long Beach. Bernhard and Dumas had hounded the R10 at both venues, but whereas last year the Audi had lumbered awkwardly (compared to the lithe Porsches) around Long Beach in particular, this time the updated car - while not a match for the lighter LMP2s in the tight sections - held its own around the twists and therefore carried a lot more momentum onto the straights where its turbo-diesel kicked in. So despite being comprehensively out-paced by their nimbler rivals in qualifying, on race day the Audis were able to march forward. This phenomenon was beautifully demonstrated at Miller Motorsports Park, where the Audis qualified only sixth and eighth, but took advantage of the long and wide pit straight to burst through to the lead before the first corner. But, and this would also prove to be a season-long trend, once in front the Audis didn't have it all their own way, as strategic vagaries amongst the regular yellows, and the LMP2 front-runners' sheer pace, kept the races wide open despite the R10's muscle. Ultimately, the Miller event was a Penske Porsche one-two, as both Audis tangled with GT cars while giving chase. More Audi incidents kept them out of the outright victory fight in round five at Lime Rock too, but this time it was Acura who claimed the win. After a quiet start to the season, Highcroft Racing had emerged as Acura's leading lights by snatching the LMP2 win and third overall from Penske at Long Beach. This was a triumph for both Acura's gains and the genius of David Brabham. The Australian veteran was the stand-out driver of the 2008 season, producing a series of tenacious charges - which were often necessary due to his co-driver Scott Sharp's relative lack of pace. Brabham had taken overall pole at Lime Rock, only for Sharp to tumble down the order in the opening stint, incurring damage along the way. Remarkably, Highcroft managed to effect extensive rear-end repairs without losing a lap and Brabham then charged through the field. He passed Bernhard for the lead with a sublime outside-line move on the penultimate lap (the Porsche spinning as the Acura swept ahead), then clung on to take Acura's first overall win despite almost running out of fuel in the final yards. This brought the LMP2 title battle alive, and Penske Porsche's points-leading duo were facing mounting pressure from the Acura squads, for although only Highcroft were in a position to challenge for the title, the sister cars were becoming major threats in the races. Gil de Ferran's eponymous new team were on the pace from the moment they joined the series, coming close to pole at the first attempt. Both the returnee Brazilian and teammate Simon Pagenaud proved blisteringly fast, and perhaps raised expectations in what was inevitably a learning season - for a few slip-ups and strategic misjudgements meant they never turned that speed into a class or overall win. De Ferran Motorsport's explosive arrival and Highcroft's results put the pressure on Andretti Green Racing. Marco Andretti had shown stunning pace for the team in a Sebring one-off - and that raised question marks over regular duo Christian Fittipaldi and Bryan Herta's performances. The team took drastic action by dropping both veterans mid-season and bringing in Franck Montagny, who would be partnered by an array of drivers from the AGR/Honda stable in the remaining races. Although it took time for the new combinations to settle in, Andretti Green would have beaten Penske to class honours at Elkhart Lake had Montagny not tangled with a GT car with only minutes to go. He made up for that by winning outright in Detroit, ending a run of three rounds in which Audi had fought through the pack to take race day one-twos. It was an important result for Andretti Green on a weekend when the team had been conspicuously absent from Acura's announcement about its 2009 plans. But despite their late improvements, it seems AGR will be out of the ALMS next year. Highcroft, along with de Ferran, will spearhead Acura's new LMP1 programme in 2009, and for a while in early autumn it looked like Duncan Dayton's team might do so as LMP2 champions, for Brabham and Sharp had narrowed Bernhard and Dumas' class lead to four points. But just as Acura appeared to have Porsche on the ropes, their title bid crumbled amid a destructive Petit Le Mans where all four Acuras were involved in shunts. Sharp's heavy crashes in both practice and the first part of the race and Penske Porsche's dominant one-two-three class sweep made sure the title remained with Bernhard and Dumas. Acura got a little revenge by beating Porsche at Laguna Seca a fortnight later (where Montagny pipped de Ferran to the class win by just 0.054 seconds after four hours of racing! ), but it was too late. The LMP2 championship resolution at Road Atlanta was utterly overshadowed by Allan McNish, Dindo Capello and Emanuele Pirro's astounding comeback from a two-lap deficit (after McNish's uncharacteristic crash on the way to the grid) to beat Peugeot, who had returned in a vain bid to salvage at least one major honour from their season. This also proved to be the No.1 Audi's only overall win of the year, as regular driver Pirro and his miscellaneous partners were generally out-paced by teammates Werner and Luhr. Pirro and team debutant Christijan Albers almost grabbed victory at Laguna, where once again Audi rocketed from lowly grid positions to the front, only for the No.2 R10 to slip ahead in the final laps. While Audi, Penske, AGR and Highcroft monopolised the wins, the prototype field had plenty of strength in depth. Dyson Racing's Porsches remained a step behind Penske's, and the team's luck didn't improve much either, but they were rarely far off the pace. The Fernandez Acuras were faster still, but even more luckless, rarely translating strong qualifying performances into race results. Audi weren't the only LMP1 team to lead races either. On a stunning opening lap at Miller, veteran Jon Field hurled the Intersport Lola from 11th on the grid to first. He determinedly fended off the Audis for several laps, although this would prove to be the sole highlight of a bruising season for Intersport. Ginetta Zytek also managed to run up front on their highly promising debut at Petit Le Mans. The GT field did their best not to be overshadowed by the epic fight up front. Although GT1 was on its last legs, GT2 was a season-long duel between Flying Lizard's Porsches and Ferrari converts Tafel. Flying Lizard duo Wolf Henzler and Jorg Bergmeister ultimately beat Tafel's Dirk Muller and Dominik Farnbacher to the crown following some very tough on-track battles. Patrick Pilet and Johannes van Overbeek were also extremely quick in another Flying Lizard entry, but lost too many points to incidents in traffic, and Farnbacher Loles' Porsche often intruded on the class lead battle too. Reigning champions Risi Ferrari were fast enough to defend their crown, but took just one class win. Jaime Melo was about to lap the rest of the GT2 field when he crashed out at Sebring, and that disaster set the tone for the team's year, as a string of technical gremlins and driver errors followed. GT2 will get tougher still next season when Corvette finally abandon GT1 for the lower division. Despite knowing they would have no opposition this year (the Bell Motorsports Aston Martin lacking the pace to challenge the factory Corvettes even in the few appearances it managed between being helped into large accidents by passing prototypes), Corvette decided the development mileage and publicity gained still made it worth participating. The two Corvette crews gave their all - even tangling (repeatedly) in the pit lane at Lexington during a typically intense internecine dice. Jan Magnussen and Johnny O'Connell turned the tables on teammates Oliver Gavin and Olivier Beretta, denying 'the Ollies' a fourth straight GT1 title, partly because the latter pair had slightly worse fortune, but also because Magnussen and O'Connell took a big step forward this year. Staying on the gas despite the lack of competition this year will stand Corvette in good stead next season when they take on Porsche and Ferrari again. The current GT2 pace-setters are eager to measure themselves against the might of Corvette, and should the depleted prototype field fail to match 2008's level of excitement, at least the GT division will continue to provide an epic manufacturer versus manufacturer contest.